The Syrian Democratic Forces (SDF) which are backed by the US are said to be fighting the ISIS which is also backed by the US. (Covertly supported by the US and its allies since Summer of 2014). So what is the purpose of this diabolical process. The ISIS is a proxy force controlled by US intelligence. It is integrated by “special forces” which are directly or indirectly in liaison with the Western military alliance. The unspoken objective is the destruction of Syria as a Nation State under the banner of a fake war on terrorism. The terrorists are “intelligence assets”, they are paid killers. They are being used in the pursuit of a criminal military agenda. And the Western media serves to mislead public opinion through lies and fabrications. In turn, the media upholds Western intervention as part of a humanitarian endeavor. And if the truth is not reaching the broader public, it’s because the corporate media controls the internet. Visibly, the independent and alternative online media is being filtered out by the search engines and social media. An intense fighting is ongoing between government forces and ISIS terrorists in the area of the Homs-Palmyra highway and near the border with Iraq. According to pro-government sources, 30 ISIS members were killed and over 50 were injured during clashes in the area of Humaymah near the border with Iraq. 2 Syrian soldiers were killed as a result of the ISIS attack at the Al-Musheirefah Hill in the eastern Homs countryside. At the same time, the Syrian Arab Army (SAA) and its allies advanced north of the Homs-Palmyra road and captured the Al-Alam Hill south of Taliaa al-Gharbia. According to local sources, government forces are going to resume the operation in the eastern Hama countryside within few days. The SAA, the National Defense Forces (NDF) and the Desert Hawks Brigade still see the liberation of Uqayrabat as a key part of the wider effort against ISIS in central Syria. Right now, government forces cannot push to Deir Ezzor because of a high number of ISIS units operating in the rear of its logistical lines. Sukhna is another point that has to be liberated to resolve the situation. An intense fighting is ongoing in eastern Damascus where the SAA and the NDF have been attempting to pressure Hayat Tahrir al-Sham (formerly Jabhat al-Nusra, the Syrian branch of al-Qaeda), Faylaq al-Rahman and Jaish al-Islam on multiple fronts. The main clashes are ongoing in the Ayn Tarma area. However, sporadic firefights were also reported in the northeastern part of the pocket. According to pro-militant sources, over 30 government soldiers were killed in the recent clashes. 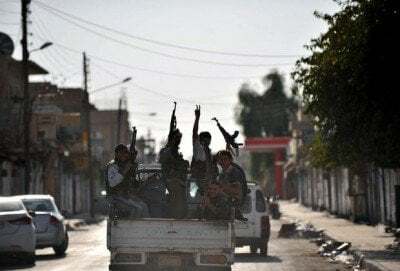 The Syrian Democratic Forces (SDF), backed up by the US-led coalition, are storming the neighborhoods of Nezlit Shehada and Al-Shaddadi in Raqqah city. According to pro-SDF sources, over 27 ISIS members were killed in the recent clashes and an IED plant was captured. According to ISIS, 8 SDF members were killed recently. The battle for Raqqah has turned into a very complicated task for the US-backed force. While there is little doubt that the city will be liberated, the question is how much time and manpower will this effort take?